Coffee-flavored soy milk is one of my son's favorite drinks. He likes Tofu, Miso, even Natto, but cannot eat edamame. :) Little strange... 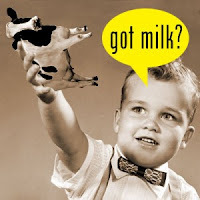 Since my son is very short for his age, many people say to me "Give him more milk!" Does soy milk contain calcium ??? I, myself, like any kind of soy products but soy milk. And I love whipped cream. Is there whipped soy cream ?? You can buy many kindes of food made from soy milk like cheese cake, cookie and Baumkuchen at the shop "Kyono Tofuya FUJINO (Tokyo Midtown)". I've never understood the reason why you can't eat cheese till now. I used to drink a litter of milk which was made very very cold per a day when I was a teennager. So, it is not exaggeration to say that milk has made me bigger. By the way, we often buy soy milk,too. Though there are many kinds of flavored soy milk, definately "Annin-flavered" soy milk is the best of all!! I didn't know soy ice cream. Soy milk is very useful. I'm Shizuka Akiba.I'm a student your English com writing class at Tokai Univ.I like soy beans and soy products too. :)But I can't drink only soy-milk...It is impossible for me to switching soy-milk from milk! My name　is Hirona Takahashi. I am dericious　when I put cocoa in soymilk.Please try it! I can't drink only soy milk. But, I like the other soy food. For example, miso, tofu, natto, soy sauce. Japanese food needs soy.